About 15 years ago I headed to Mall of America and my only real memory is how cool the aquarium was. I mean to be able to check out a huge aquarium right in the mall was pretty amazing to me. My one main memory was of being in a tube with fish all around me and that is a memory my kids now have from SEA LIFE Aquarium in Mall of America. 1. It is right in the mall! No driving anywhere else, just head down to the lower level in the mall and walk on in! Your ticket also entitles you to leave the aquarium and come back when you get a handstamp. This is great for if you need a break or want to eat, but you are not quite done in the aquarium. We spent a total of around 2.5 hours but was hoping to pop back in later. 2. There is a 1.3 million gallon aquarium to explore. With thousands of sea creatures including freshwater Stingrays, four-foot Alligator, 350-pound Sea Turtles, 9-foot sharks, Jellyfish and even Seahorses. 3. There are spots to touch the animals – both free and at an additional cost. My kids were amazed they were allowed to stick their hands in the water and that the creatures were actually alive. There is also a spot to feed shrimp (additional purchase) to stingrays! 4. There are Daily Talk Times that are free where SEA LIFE staff members talk and answer questions about various creatures. The schedule is posted and awesome for curious little minds who are interested in specific animals. 5. For a low price of just $10 a person, you can add on a Behind-the-Scenes Tour which is a 45-minute guided tour up on a deck above their tunnel system so you can see animals currently off-exhibit. Visitors will also get to see the Laboratory to find out how they treat and maintain the 1.3 million gallons of water that make up the aquarium. The tour concludes in the Food Prep Kitchen where you get to see what they feed the thousands of creatures to keep them healthy. 6. There are tons of interactive exhibits for kids to learn more about. There are signs to read and flip as well as a free kid guide – Dive Log Book – where kids are encouraged to get their guide stamped at various exhibits. 7. Other activities include School Trips, Snorkel with the Fish, Overnights, Weddings and Proposals. There are tons of extra activities to participate in. 8. SEA LIFE runs breeding programs for rays, jellies and seahorse. They are part of the largest seahorse breeding network in the world. I used this as a lesson about seahorses for my kids. 9. The newest exhibit is all about…Poop! 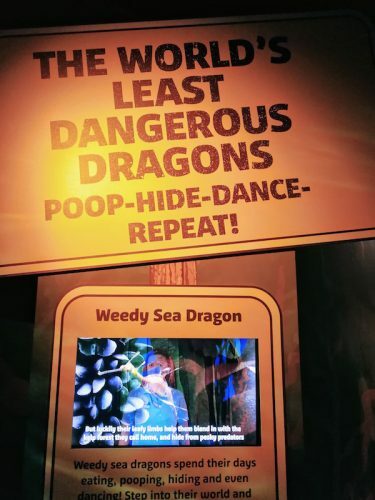 Well actually it’s about the Weedy Seadragon whose life is all about pooping, hiding and dancing! 10. SEA LIFE Minnesota is completely wheelchair and stroller accessible. Visit the SEA LIFE website to check out hours at the Mall of America location or see if there is one near you. Oh what a fabulous adventure for a family to explore and learn about sea animals. Sounds like an exciting place to visit. Love the photos. I am going to be going to the Mall of America for the first time and am really excited. We have a Sea Life aquarium in Kansas City that the kids like. We now have a SEA LIFE AQUARIUM at Great Lakes Crossing in Auburn Hill, MI. I have not been to it yet but they also have SEA LIFE AFTER DARK for the 21+ crowd.